Department of Electrical Engineering, University of Gadjah Mada, Indonesia. 1.3. S.T., Sarjana Teknik, 1998, Undergraduate Program, Department of Nuclear Engineering, University of Gadjah Mada, Indonesia. 1.4. IATSS Forum Program, Japan, September-November 2003. 1.5 Internships Program at Department for Transportation, Energy, and Infrastructure of South Australia (SAGEMS unit, SMS-based system for transportation, ‘Single Point’ project), December 2008. COBIT 5 : International professional certification in COBIT 5 Framework, ISACA, December 2016. Information Technology Infrastructure Library (ITIL) : Foundation Certificate in IT Service Management, EXIN, 12 March 2015. Lecturer : National certification for lecturer, the Indonesian Ministry of Education Directorate General of Higher Education (DIKTI), 2014. Procurement of Government’s Goods and Services : National certification for an expert in procurement fo government’s goods and services, National Public Procurement Agency (LKPP), 2012. Marketing Manager : Professional certification for marketing manager, Labor offices, Yogyakarta Province, 1999. Radiation Protection Staf (PPR): National certification for Radiation Protection Staff, National Atomic Agency (BATAN), 1996. – Database Full Package by Oracle at Inixindo, Indonesia (2005). – Training for Lecturer Skill (PEKERTI) – Directorate General of Higher Education (DIKTI), Indonesia (2002). – Training for Trainer – Department of Manpower (Depnaker), DIY, Indonesia (1999). National Occupational Skill Certificate of Marketing Manager – Department of Manpower (Depnaker), DIY, Indonesia (1999). Australian Leadership Award Conference, Canberra Australia (March 2008). Australian Leadership Award Workshop, Western Australia (July 2008). – ‘English Academic Program & Australian Culture’ at TafeSA-Panorama Campus, South Australia (April– December 2005). – Japanese course at Lembaga Bahasa Jepang, Yogyakarta (2003). National Occupational Skill Certificate of Radiation Protection Staff – National Atomic Bureau (BATAN), Indonesia (1996). Australia Leadership Award (ALA), it is a special scholarship for Asian Pacific countries/level from Australian government. 2001-2003 Gadjah Mada BPPS Scholarship Post Graduates Scholarships for my master study. December 2011: Coordinator of the Australian Youth Exchange Program (AIYEP) — an initiative of the Australia Indonesia Institute (Department of Foreign Affairs and Trade). As Tutor : I teach and assist international students with Ms. Word, Ms. Excel, Ms. Power Point, End Note and SPSS. As Data Analyst: doing some entry data and data analysis using Ms. Excel and SPSS. As Visiting Researcher: I conducted researches in e-government topics, wrote and published papers to science journals and international conferences. 1 November 2000 – 29 November 2008: Lecturer at Department of Informatics Engineering, “National Development University” (UPN), Yogyakarta, Indonesia. I taught “Decision Support System”, “Mobile Technology”, “Interpersonal Skills”, “Ethics for Computer Science”, “Research Methodology and Presentation Techniques”, and “English for Computer Science topics”. 2003 – March 2005: Student Research Coordinator at Department of Informatics Engineering at the “National Development University”, Yogyakarta, Indonesia. I developed the research system (the regulation as well as the computer-based information system) to increase the quality and quality of students’ researches. It succeeded to increase the number of research proposals up to 3 times, to reduce students’ accomplishing time by 50%, and to overcome the ‘bottle neck’ graduation problem of students in their final years. I managed the research activities including investigating a new research area, to encourage students to conduct research activities, to appoint supervisors for each student’s research, and to monitor progress of the researches in quality and quantity. 2006 Associate Lecturer of “STMIK Amikom”,Yogyakarta, Indonesia. I taught “Decision Support System” topic. 2002 Associate Lecturer of “Yogyakarta Technology University”,Indonesia. I taught “Introduction for Information Technology” topic. 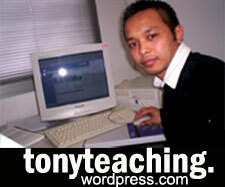 2001 – 2002 Associate Lecturer of “YDHI Polytechnic”, Indonesia. I taught “Computer Architecture” and “Information Systems” topics. 2001 Associate Lecturer of “Salemba” School of Business, Indonesia. I taught “Introduction System” topic. Maret – November 2016: Konsultan, Dinas Komunikasi dan Informatika kota Surabaya; Pembuatan Portfolio Sistem Informasi Pemerintah Kota Surabaya. Juli – September 2016: Konsultan, Bagian Pengolahan Data Elektronik (PDE), Pemerintah Kota Kediri; Pembuatan Sistem Informasi Suara Warga (SURGA) Pemerintah Kota Kediri. Juli – September 2016: Konsultan, Bagian Pengolahan Data Elektronik (PDE), Pemerintah Kota Kediri; Perencanaan Command Center Pemerintah Kota Kediri. Februari – Juni 2016: Konsultan, Bagian Pengolahan Data Elektronik (PDE), Pemerintah Kota Kediri; Feasibility Study Command Center Pemerintah Kota Kediri. November – Desember 2015: Konsultan, Bagian Pengolahan Data Elektronik (PDE), Pemerintah Kota Kediri; Pembuatan Sistem Informasi e-Health Pemerintah Kota Kediri. September 2015 – Maret 2016: Konsultan, Dinas Komunikasi dan Informatika kota Surabaya; Kajian Tata-Kelola TI (kondisi kekinian) Dinkominfo Kota Surabaya. Juli – September 2015: Konsultan, Pengolahan Data Elektronik (PDE) Kota Kediri; Desain Jaringan Fiber Optic Kota Kediri. 2006 – 2007 : Head of K3 Project Proposal and Brain-ware unit – Computer Based Information System (CBIS) at the “National Development University”, Yogyakarta, Indonesia. It planed and implemented the research programs, including E-learning Systems, Research Information System, and Library Information System. 2004 – March 2005: Head of Multimedia Laboratory at Department of Informatics Engineering at the “National Development University”, Yogyakarta, Indonesia. June–September 2003: Coordinator of Training Program, E-government Development Project of Selayar Island, Province of Sulawesi Selatan, Indonesia. Managing the training, financial, staff, and marketing business. 2000 Marketing Consultant of “FRONTLINE”- Promotion Staff Training. 1998–1999 Director of “Indonesian Educational Network” Yogyakarta – Educational software company. 1998 – 1999 Manager of “INTERNET GADJAH MADA” Yogyakarta, GMI group. 1994 – 1998 Director of “TELADAN SCIENTICA” Course, Yogyakarta. 1997 – 2005 Comedian atIndosiar and TVRI (National Televisions), RB-TV (Local Television), and national tours under ELBEHA group and Plat-AB group. 1995 – 2001 Announcer at Bikima-AM, Rakosa-FM, Petra-FM, and RB-FM Radio stations. Computer maintenance (hardware, software), Computer assembly, Virus protection, etc. Web Design and Programming using PHP, MySQL, HTML, Adobe Photoshop, Macromedia Dreamweaver. Graphic Design/Desktop Publishing using Adobe Photoshop and Corel Draw. 4.2. Intercultural Communication Skills which welldeveloped throughexperiencing living and studying in 4 countries with very different culture, language and values: Indonesia, Japan, Saudi Arabia and Australia. 4.3. Good Communication Skills developed through 6 years experience as radio announcer, 8 years as comedian and entertainer in national level, and 14 years as tutor/lecturer. 4.4. 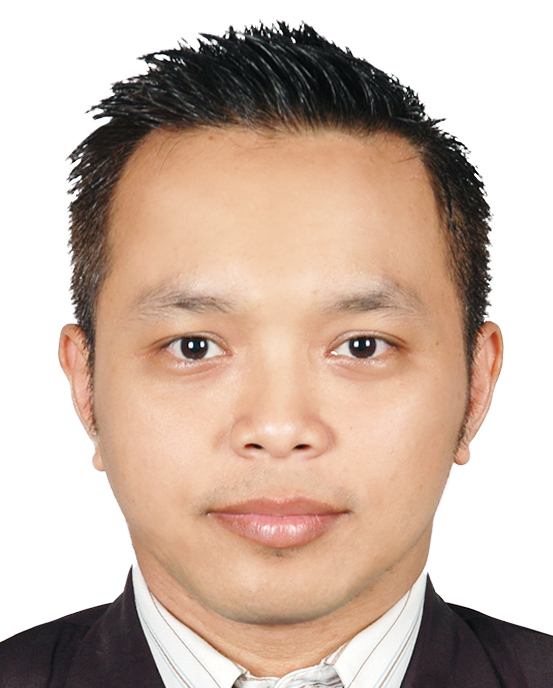 Trainer/Lecturer Skills developed since 1994 as a tutor and up to now as a lecturer in national university in Indonesia and as a tutor in international university in Australia. 4.5. Entrepreneurship and Leadership demonstrated in my initiatives and supervisory roles in my businesses and projects, and by granted the Australian Leadership Awards from Austalian government for my PhD (2008-2012) and represented Indonesian’s young professionals in IATSS Forum ASEAN-Japan (2003). 4.6. Project Management Skills and ability to work in a team demonstrated by involvement in e-government research project in Selayar Island and K3-ICT project at UPNVY. Susanto, T. D., & Goodwin, R. (August 28−September 2, 2011). User Acceptance of SMS-based eGovernment Services. Paper presented at the IFIP−EGOV2011, Delft, the Netherlands. Susanto, T. D., & Goodwin, R. (in press). Individual Acceptance of SMS-based eGovernment Services: A Conceptual Model. In F. Patel, P. Sooknanan, G. Rampersad & A. Mundkur (Eds. ), Information Technology, Development and Society: Routledge USA. Susanto, T. D., & Goodwin, R. (May 6−7, 2010). Adoption Success Factors of SMS-based eGovernment: A Case Study of SMS-OBM and SMS-MIIAS. Paper presented at the The 3rd International Conference on Chief Information Officer (ICCIO), Bandung, Indonesia. Susanto, T. D., & Goodwin, R. (2010). Factors Influencing Citizen Adoption of SMS-based eGovernment Services. Electronic Journal of E-Government (EJEG), 8(1), 55-70. Susanto, T. D., & Goodwin, R. (2011). An SMS-based eGovernment Model: What Public Services can be Delivered through SMS? In A. T. A. Ajeeli & Y. A. L. Al-Bastaki (Eds. ), Handbook of Research on E-Services in the Public Sector: E-Government Strategies and Advancements (pp. 137-146). New York: IGI Global. Susanto, T. D., Goodwin, R., & Calder, P. (October 23−24, 2008). A Six-Level Model of SMS-based eGovernment. Paper presented at the International Conference on E-Government (ICEG) 2008, Melbourne. Susanto, T. D., & Goodwin, R. (June 17−19, 2007). 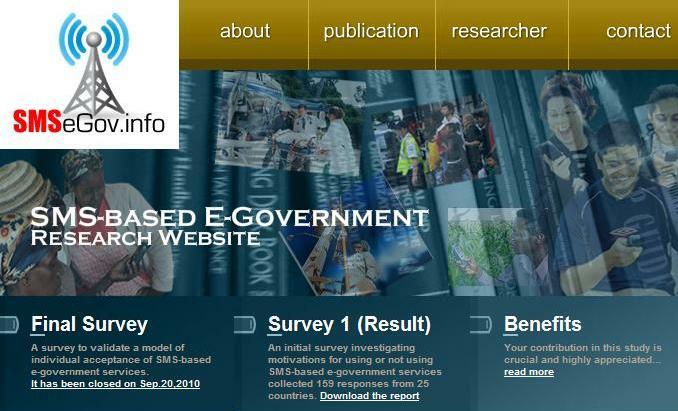 Preferable Medium in Using eGovernment: A Case Study of Yogyakarta Province, Indonesia. Paper presented at the International Conference on Electrical and Informatics (ICEEI) 2007, Bandung, Indonesia. ; also published at Information & Communication Technology Journal (JICT) Vol 2, No 1 (2007). Susanto, T. D., & Goodwin, R. (June 17−19, 2007). Content Presentation and SMS-based e-Government. Paper presented at the International Conference on Electrical Engineering and Informatics, Bandung, Indonesia. Susanto, T. D., & Goodwin, R. (December 4−6, 2006). Implementing SMS-based eGovernment Model. Paper presented at the 8th International Conference on Information Integration and Web-based Applications & Services (iiWAS2006), Yogyakarta. Susanto, T.D., & Goodwin, R. (June 12−14, 2006). Opportunity and Overview of SMS-based eGovernment in Developing Countries. Paper presented at International Conference on the Internet & Society 2006, the New Forest, UK. ; also published as a chapter of book of The Internet Society II: Advances in Education, Commerce & Governance (Vol. 36, pp. 10). The New Forest, UK: WIT Press. Susanto, T. D., & Goodwin, R. (May 23−27, 2006). An SMS-based e-Government model. Paper presented at the 8th International Conference on Enterprise Information System (ICEIS), Cyprus. Susanto, T.D. Standardization of Road Signs in ASEAN Nations. IATSS Forum Program – Group Research Report, Japan (November, 2003). Susanto, T. D., & Goodwin, R. (December 4, 2010 ). User Acceptance of SMS Applications for Public Services. Paper presented at the SESINDO, Surabaya, Indonesia. Susanto, T.D. Software Development Strategy for Enterprises, Telematika, Vol. 1 No.1 Juli 2004. Susanto, T.D. Research Information System (RIS). LPPM-UPNVY (2004). Susanto, T.D. Information Technology Strategy for University. Wimaya No. 36 XXI, December (2003). Susanto, T.D. Inventory Management Decision Support System (DSS) by Fix Ordered Quantity Supply Model. Thesis research of Master Program at “Informatics Computer Systems”-Department of Electrical Engineering, University of Gadjah Mada, Indonesia (June, 2003). Susanto, T.D. Operational Effect of Kartini Reactor toward DO, BOD, and COD Values of Primary Cooling Water. Research at Undergraduate Program, Department of Nuclear Engineering, University of Gadjah Mada, Indonesia (June, 1998). Speaker for South Australia Computer Human Interaction (SA-CHI) group, Adelaide, South Australia, 31 March 2009. 2009 – present Member of the Association for Information Systems (AIS). 2013 – present Member of the Association for Information Systems – Indonesia chapter (AISINDO). 2009 – 2012 Member of the Australasian Association for Information Systems (AAIS). 2003 – present Member of IATSS Forum Alumni, ASEAN-Japan. 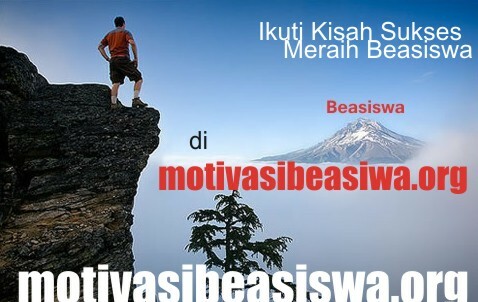 wah saya salut banget dengan usaha bapak, saya jadi terinspirasi nih pak, padahal saya sdh mulai putus asa ngurus beasiswa bpps ( padahal posisi saya lebih beruntung dari pada bapak, krn saya sdh ngantongi sk yayasan ). oh iya pak , apa semua beasiswa bpps cuma 50% ya? Mashallah Tony, i’m impressed with your CV. May Allah benefits with your knowledge. halo Reza, salam kenal juga..makasih! sukses juga buat kamu! Salam kenal Pak Toni, Saya dulu pernah ketemu ketika mahasiswa di UPN ‘V” YK. Jika berkenan bisa main ke UAD Pak, untuk sharing ilmu di Prodi Kami Informatika dan Sistem Informasi.